The state of Virginia has so much to offer. From its beaches to its mountains, as well as its “Goldilocks Climate” (not too hot; not too cold), there are so many reasons and opportunities to get outside. With that said, as you enjoy those outdoor activities, it’s important to keep your skin protected from the harmful rays of the sun. Exposure to ultraviolet light is the primary cause of skin cancers and premature aging. Both of these can be largely avoided by protecting the skin from ultraviolet rays. If you’re going to be outdoors enjoying any of the 5 distinct climate regions Virginia has to offer, one of the best things you can do to protect your skin is to wear sunscreen. Wearing protective clothing and avoiding the sun at the hottest times of the day (10 am - 4 pm) can also reduce the risk of developing skin cancer. However, with so many options, numbers, and phrases on sunscreen packages, choosing the one that’s best for you can be a challenge. Here are some things to help you understand what you’re reading on a sunscreen label. Choose the type of sunscreen you prefer to apply. 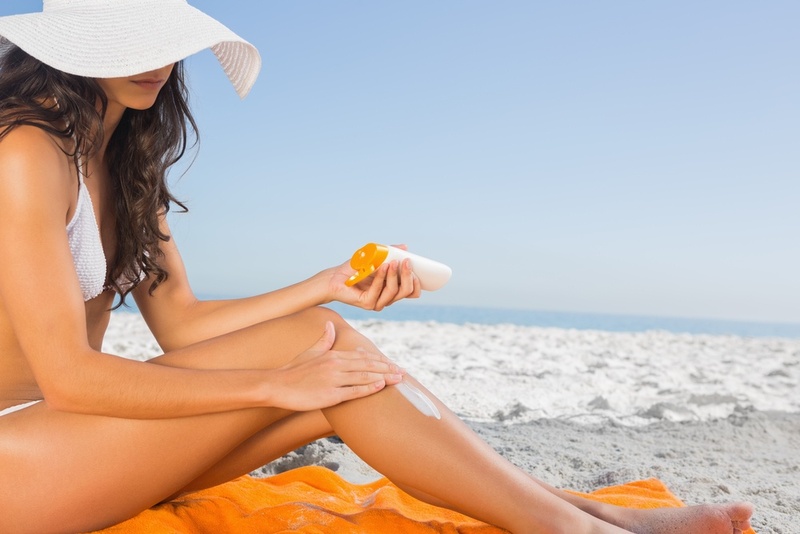 Sunscreen comes in a variety of options that include lotions, sprays, sticks, and gels. In the end, it really just comes down to your preference. You may prefer a stick for areas including your face and your ears while a lotion or spray may be easier to cover larger areas like your back, legs and arms. What matters more than the format of the sunscreen is the ingredients it has to offer. Choose a high enough SPF. The sun protection factor (SPF), in a product ranges from 2 to 100 and refers to how much of the sun’s UVB rays are blocked. The American Academy of Dermatology recommends wearing sunscreen with SPF of 30 or higher. To find out more about what SPF means, read our blog What Does SPF Mean? Select a broad spectrum sunscreen. The sun generates both ultraviolet (UV) A and B rays. UVA rays cause premature aging of the skin (wrinkles and age spots.) UVB rays cause sunburns. Both UVA and UVB rays can contribute to skin cancer and your sunscreen should include protection from both. Sunscreens that cover both are typically labeled “broad spectrum.” If the sunscreen doesn’t say “broad-spectrum” your skin is only protected from UVB (burning) rays. Identify the active ingredients you prefer. Barrier sunscreens like titanium dioxide and zinc oxide put a layer of protection between the sun and your skin that deflects the sun’s rays. This is often available in a white, thick cream or stick. Chemical sunscreens absorb the sun’s rays often using active ingredients oxybenzone or avobenzone. Remember that water resistant is not waterproof. “Water resistant” and “sweat resistant” mean the same thing on a sunscreen label: these sunscreens have been proven to remain effective for at least 40 minutes while you’re in the water or sweating. You have to reapply when you get out of the water to prevent sunburn. Next time you head outdoors, whether it’s all day or just running errands in your car, be sure to apply broad-spectrum sunscreen of SPF 30 or higher so you can enjoy your time in the sun knowing you’ve taken an important step to reduce your risk of skin cancer. And don’t forget to reapply! Read more skin cancer prevention tips about common sunscreen mistakes that you might be making.